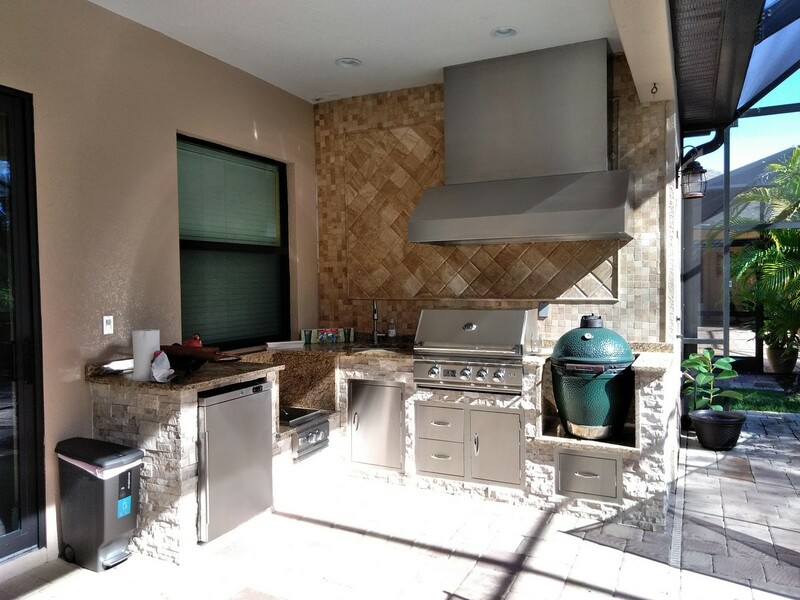 We designed this kitchen in a compact space to accommodate a full range of appliances, including a Summerset Grill, Power Burner, Big Green Egg, Vent a Hood hood vent and a Summerset Fridge. 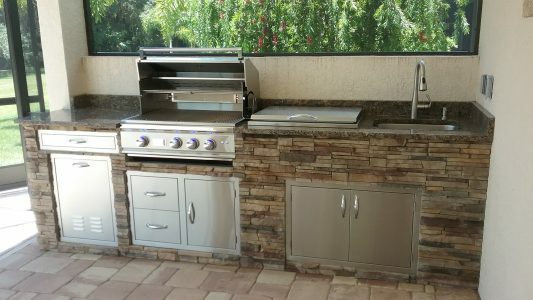 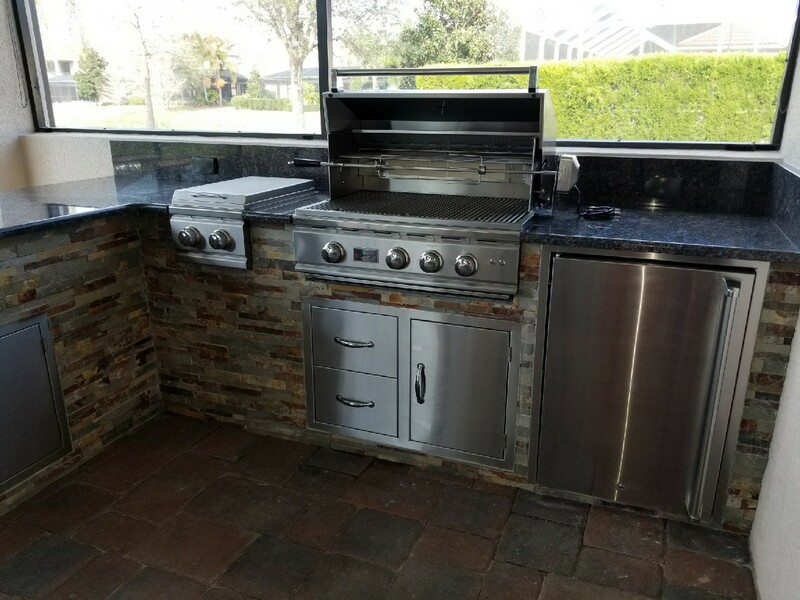 The AMG grill with granite and tile backsplash is the focal point of this unique outdoor kitchen. 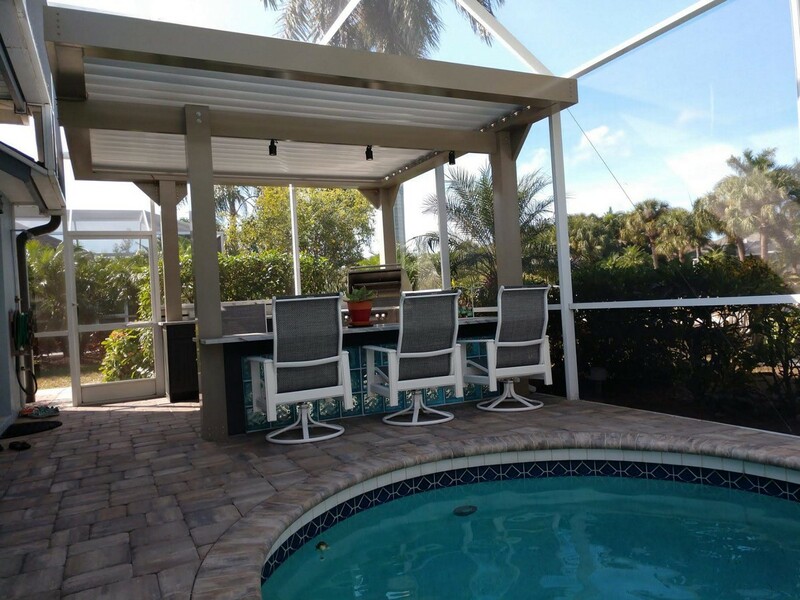 The wrap around bar maximizes the space and opens up ample room for entertaining and food preparation. 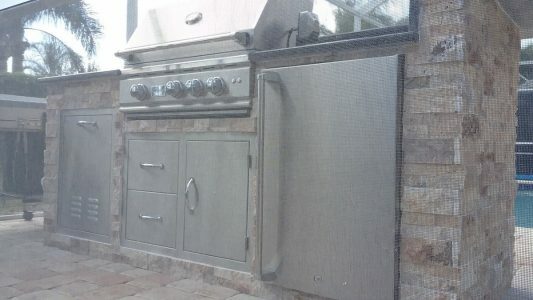 The Vent a Hood hood vent presented a challenge, making it necessary for us to punch through the roof to run out the exhaust. 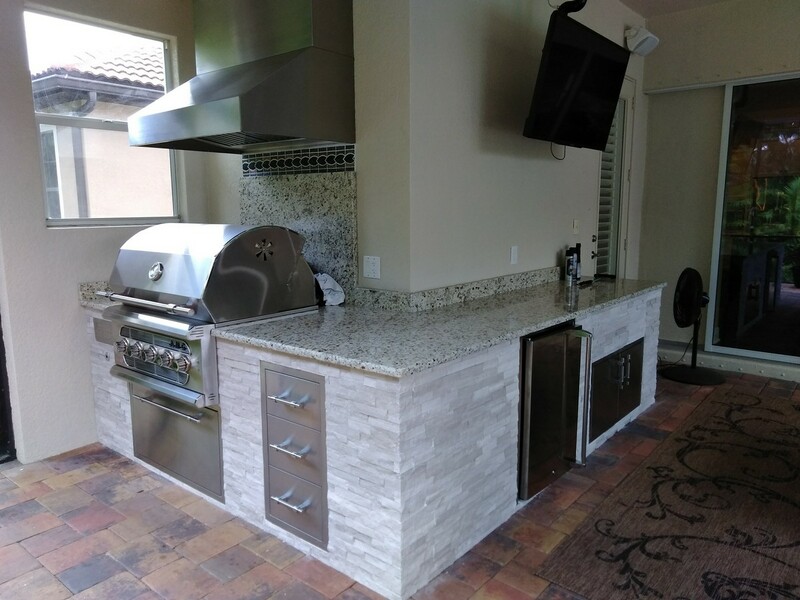 The kitchen we crafted for this Bradenton lanai features an Artisan grill, a custom backsplash and a stucco wall behind the unit. We also stoned the columns on the pool deck to match. 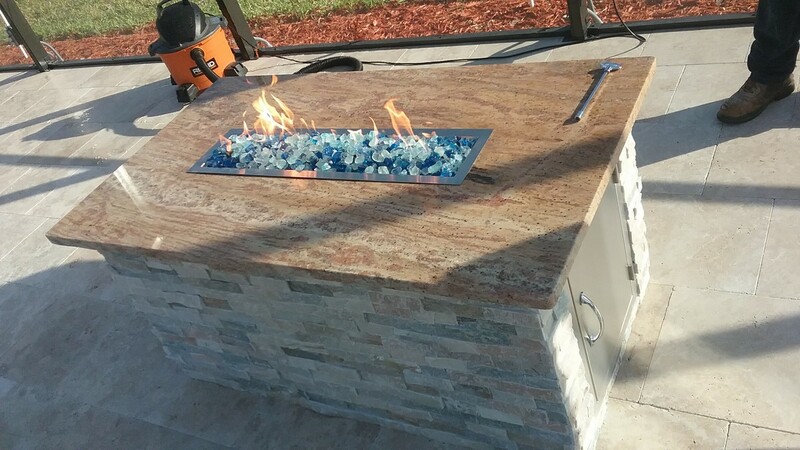 These Bradenton customers requested a fire table and grilling area with matching stonework and granite tops. 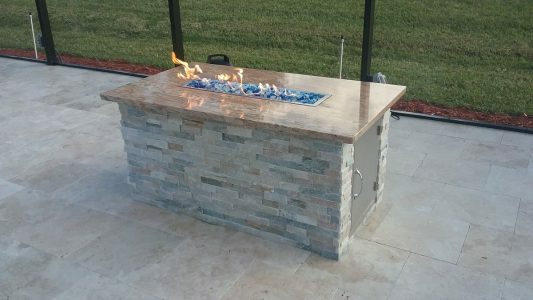 The fire table is custom-made, and the barbecue area features a Summerset grill, a flush mounted ice maker, an outdoor fridge and door/drawers. 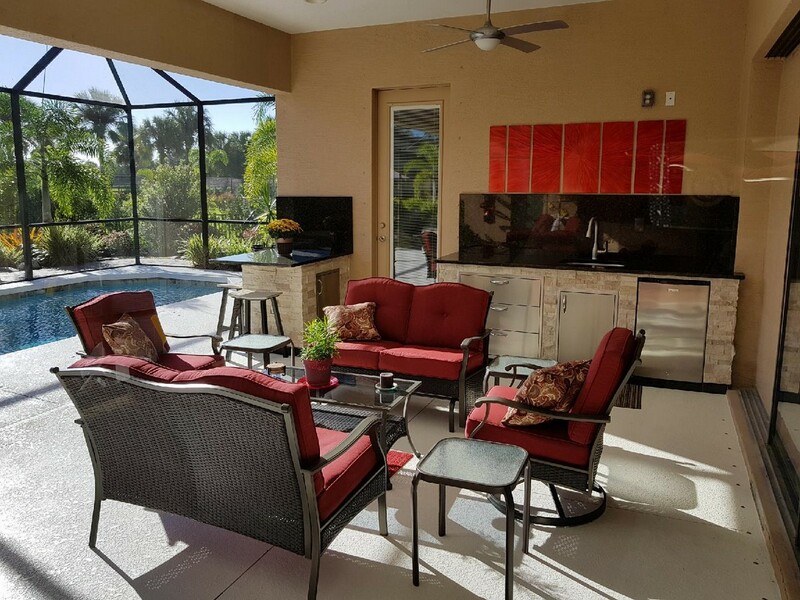 This poolside kitchen features an L-shaped design with a bar area and Summerset appliances. 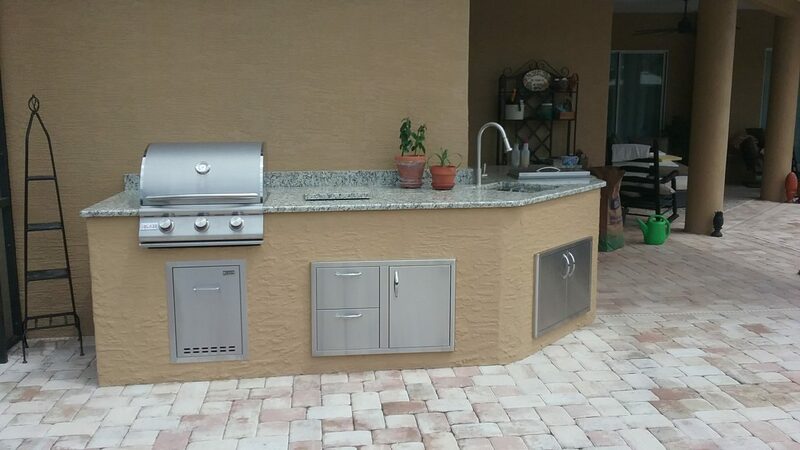 We designed this unique, split outdoor kitchen to make the best use of the available space in this customer’s poolside entertaining area. The kitchen features a full height granite backsplash, Blaze appliances and a custom granite kickplate. We also renovated the inside of her house wall to match the stone on the outside. 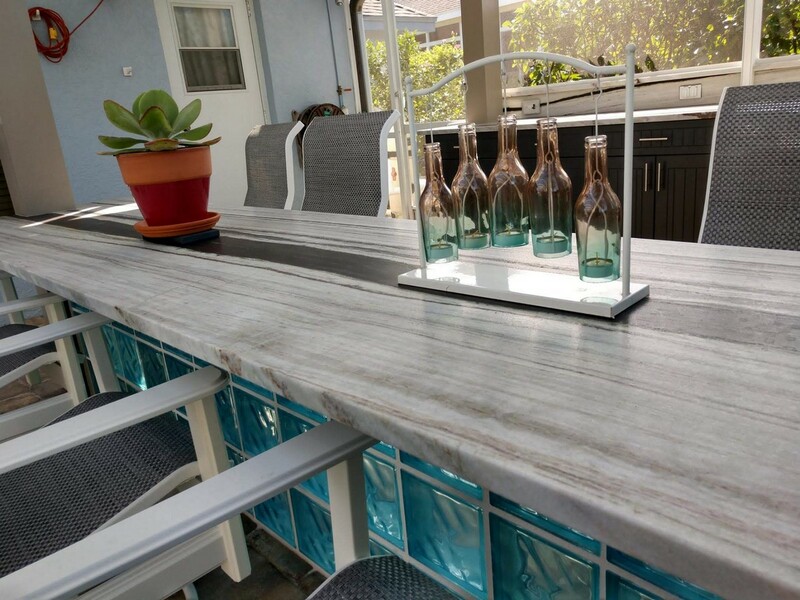 For this poolside outdoor kitchen island in Bradenton, we installed a raised bar area with Summerset appliances. 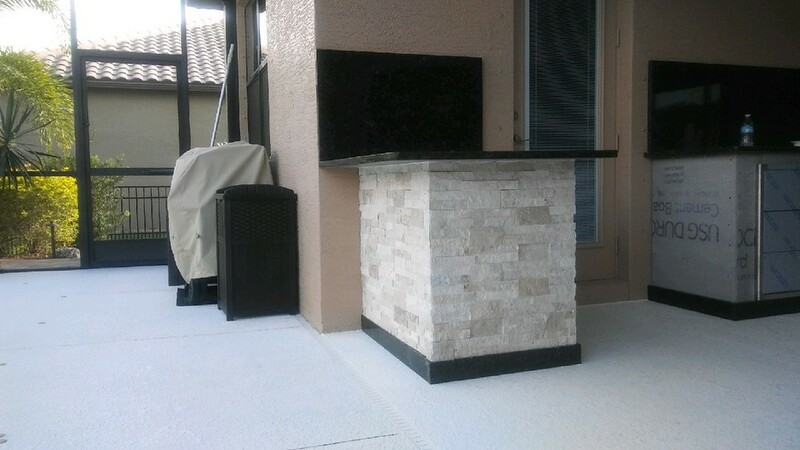 The facade is covered in beautiful Travertine stone. 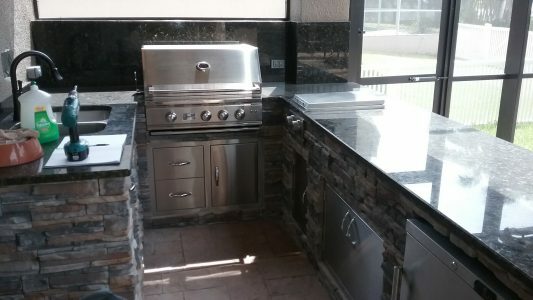 These customers came to us after purchasing their appliances, asking us to build a frame to house them. 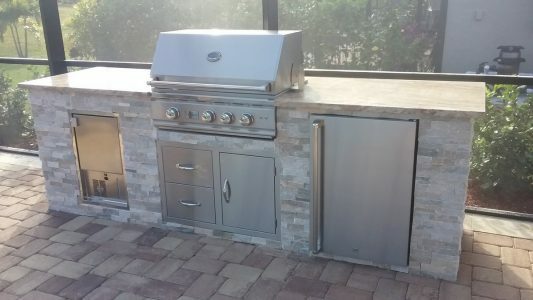 The appliances included a Blaze grill head, double burner and fridge; a Lion slide-out propane door; and an undermount built-in ice chest, doors and drawers by Sunstone. 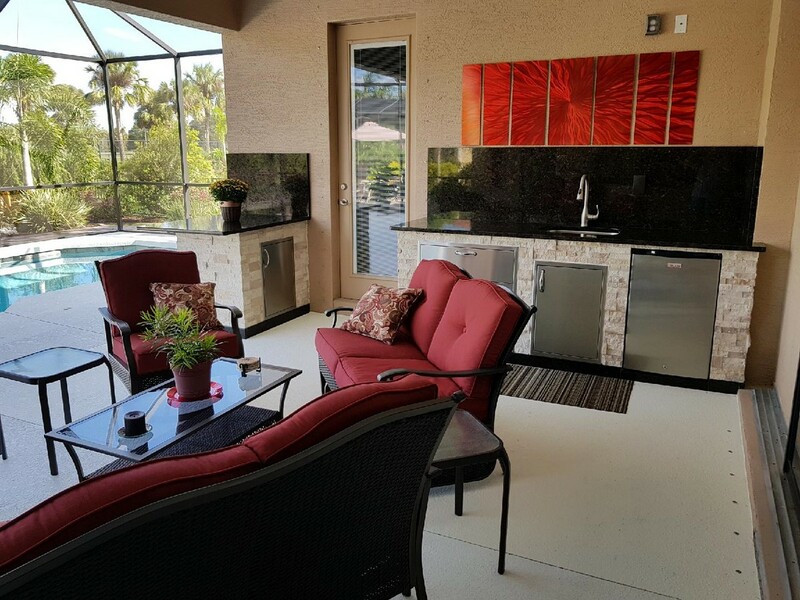 We placed the outdoor kitchen in this location to allow for clearance around the pool and the columns throughout the lanai. The wrap-around design made the best use of space while still accommodating the variety of appliances and accessories. The customers decided on a stucco finish to match the house, paired with neutral granite countertops. 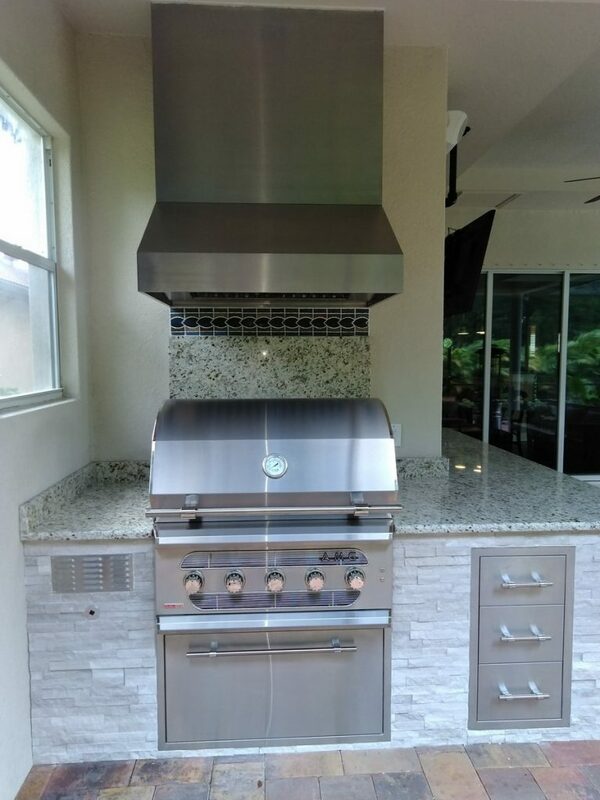 A set of Blaze appliances, including a 25” grill, an ice maker, outdoor rated refrigerator, sink and double access doors, are at the heart of this Bradenton outdoor kitchen. We had to run new electric for the self-venting hood vent by Vent A Hood. 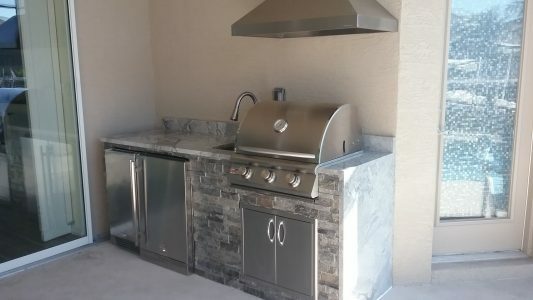 Also, the ice maker required a custom drain pump. 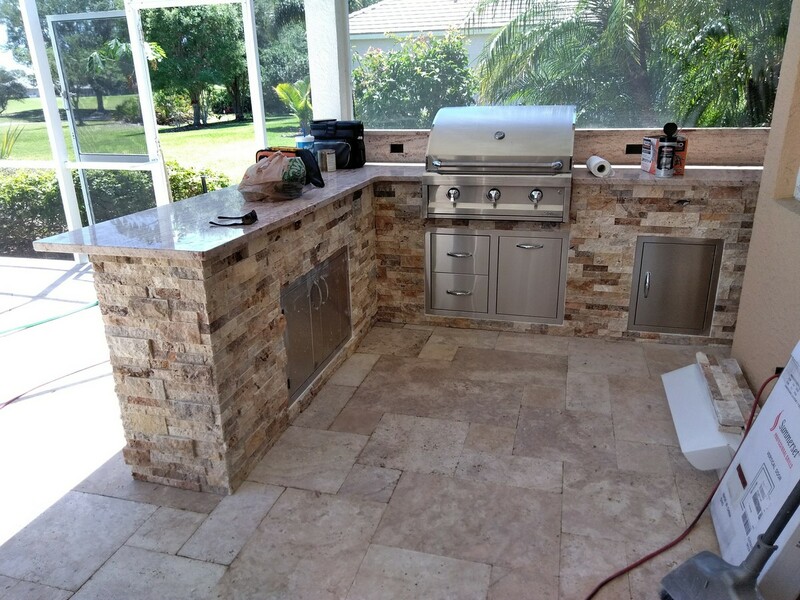 Perhaps the most eye-catching feature of this design is the level 4 granite, which culminates in a seamless, waterfall side. 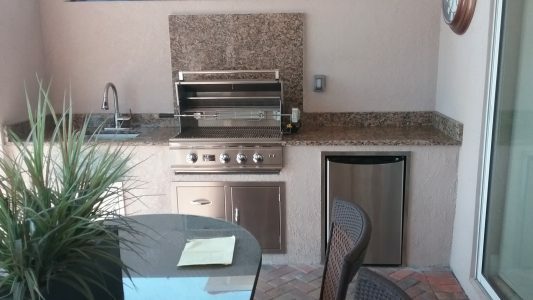 This kitchen features all Summerset appliances, including a 32″ TRL grill, a sink and a large, drop-in ice chest. 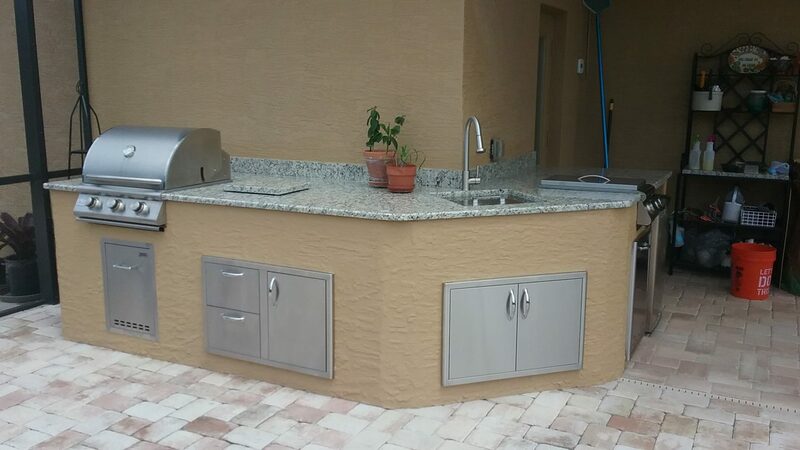 In addition to the access doors and door/drawer combo, we also installed a utility drawer and a trash drawer. Granite counters and cast stone façade provide the finishing touches. 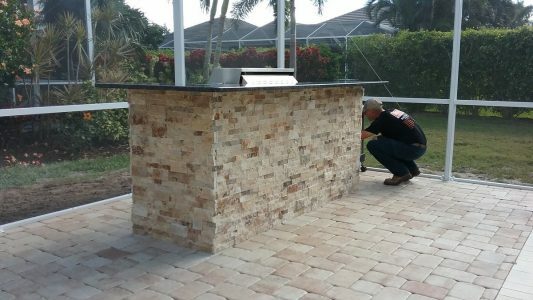 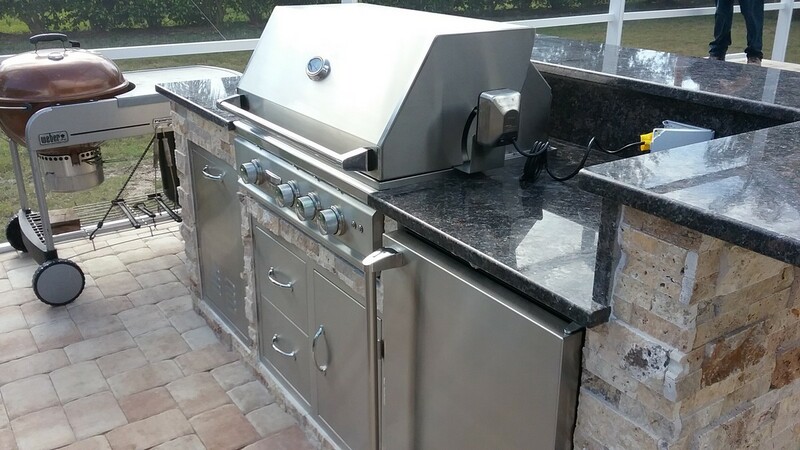 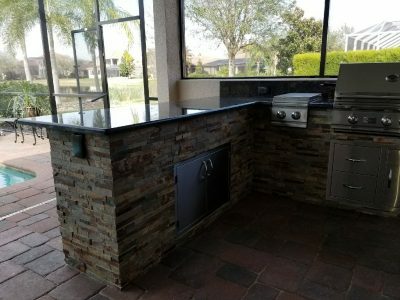 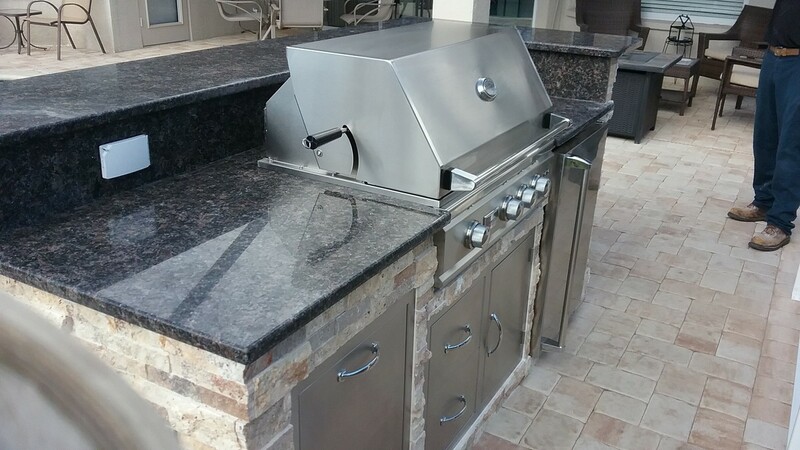 Installing the outdoor kitchen in this Bradenton home proved to be a challenge. The lanai was relatively small, with no existing plumbing or electrical. 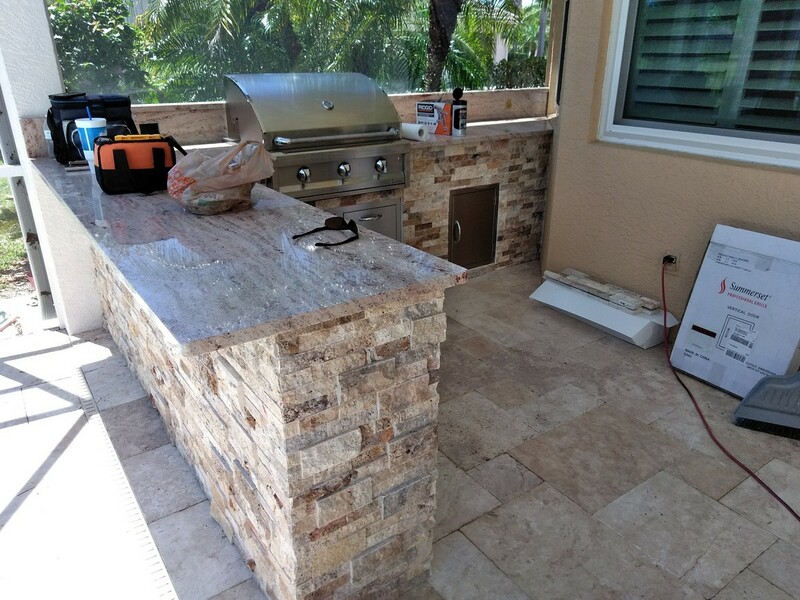 We found ourselves running the plumbing from the front of the house – a distance of around 200 feet. 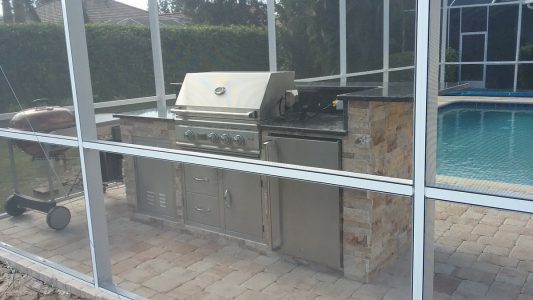 However, we surmounted the obstacles and gave the customers just what they had in mind – an outdoor entertaining space with easy access from their spiral staircase on one side and their renovated garage on the other. 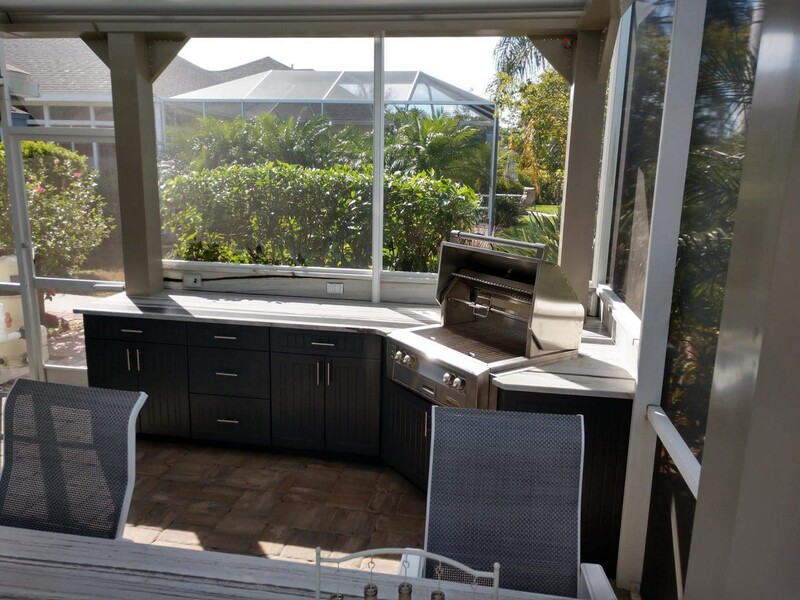 The galley-style design makes great use of space, allowing for all of the desired appliances as well as bar seating on the other side of the counter. The appliances included a Summerset TRL 32” grill with a door/drawer combo, a TRL series double side burner with an access door underneath, a custom-built pantry, a trash can pull-out and an outdoor rated fridge. The cast concrete stone work and full height granite backsplash add the finishing touches to the design. 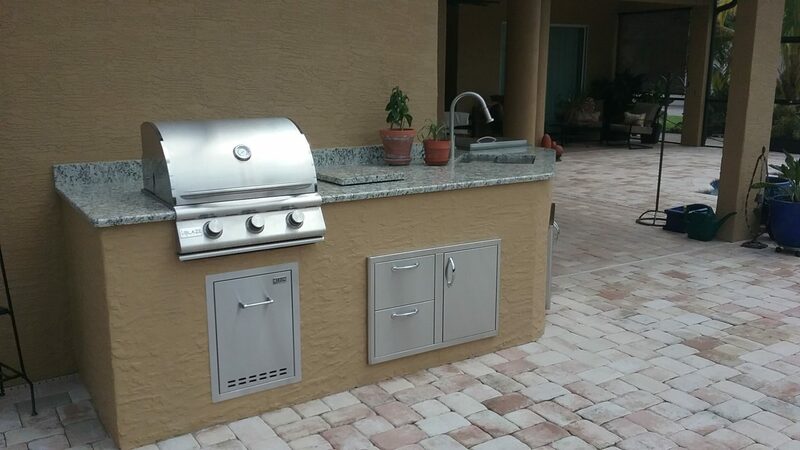 Existing electric wiring and the ease of running the plumbing made the location for this Bradenton homeowner’s new outdoor kitchen a logical choice. The appliances are all from Summerset, including the grill with rotisserie, the mini fridge with stainless steel trim, the sink and the access/storage doors and drawers. 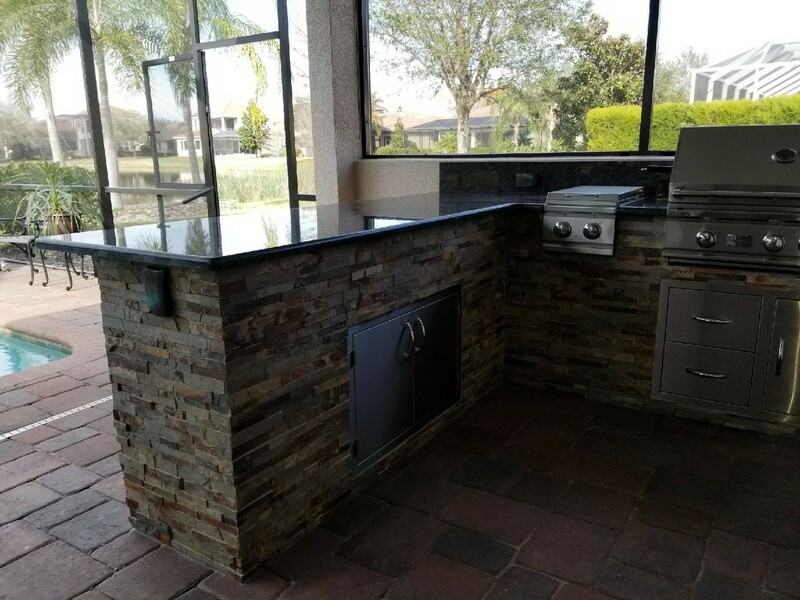 The countertops are granite, as is the full-height backsplash. 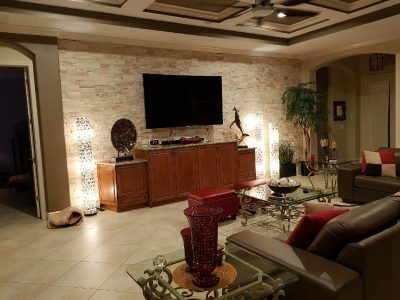 For the frame, the customers selected a custom stucco finish instead of stone. 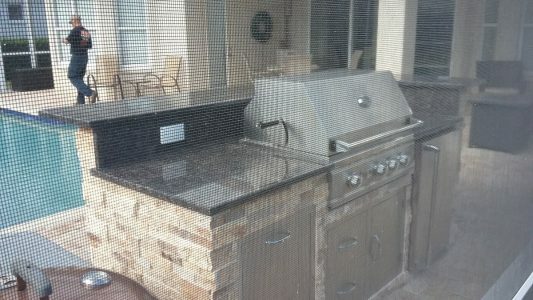 Having young grandkids, they thought that the smoother surface was a safer choice.